After a late night dancing in Paceville (that's a loose interpretation of the word "dancing"), we struggle to get up on this grey Monday morning in Sliema. We do eventually make it down to breakfast at 9:30 for a most satisfying cooked breakfast enjoyed in front of a panoramic sea view. Back upstairs on our balcony, as we finish drying our gear with the hairdryer, I notice an aircraft carrier sailing in to port, flanked by two helicopters. It's hard to tell exactly where the ship is going to dock, as the coast bends a little out of sight, but we'll keep an eye out as we make our way in to the capital. After a reminder call from reception at 10:30, we check out right on the 11:00 deadline and recover our bikes from the baggage room. It's nice to have kept them dry overnight but, as we cross the road to reach the promenade, rain drops begin to fall again. We must rapidly seek shelter in a covered walkway. We've stopped right in front of a chemist, which is ideal as I am still on the seemingly impossible mission to buy a can of deodorant, having had mine confiscated at Gatwick security. Although, after last night's smoky club, I feel that Febreze might be more appropriate. The rain eases after about twenty minutes and, smelling fresh, we get back on our way, following the promenade around the bay towards Valletta. Today is our first weekday on the island and, although there's commuter traffic, there are surprisingly few pedestrians about. We will be riding in a giant horseshoe around Marsamxett Harbour today, covering about 10 km through Sliema, Gzira, Msida and Floriana to arrive just across the harbour in Valletta, at a point which is in reality only about 2 km from where we are now. 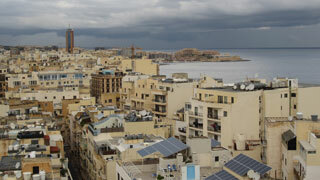 Valletta sits on a peninsula sandwiched between Marsamxett Harbour, to the north, and the Grand Harbour, to the south. The area around each of these harbours is densely populated and it is hard to distinguish where one town ends and the next begins. We've arranged to meet our man from Malta By Bike to return the bicycles at 13:30 in the centre of Valletta and, with two hours to cover 10 km, we feel confident in adopting a leisurely pace. However, within minutes of setting out again after the rain, Gareth notices that his rear tyre is now almost flat. 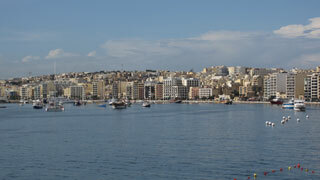 We're at Tigne Point, within the confines of a large new housing development. Suddenly the pressure is back on. With Gareth booked on a flight this afternoon, there's little room for delay. At least the sun is finally shining and there's just a gentle sea breeze. I have even found my puncture repair patches, which I did not realise I had brought. Despite all this, the puncture turns in to a little bit of a nightmare; difficult to locate and therefore impossible to mend. Still without the tool needed to remove the wheel, we have no option but to continue on our way and hope for the best. It looks like Gareth will need to battle the slow puncture by occasionally inflating the tyre. From Tigne Point, we must fight our way through a long stretch of road works and slow-moving traffic, where more regeneration is going on. We become separated by the congestion and it turns out that Gareth has once more stopped to try and fix his tube, again without success. The situation is frustrating and Gareth is keen to finish the ride as quickly as possible. He takes the direct route while I make a short detour on to Manoel Island, an island in the centre of Marsamxett Harbour which is attached to the mainland by a short road bridge. An impressive fort occupies the far end of the island. 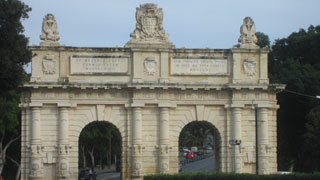 Completed in 1726 to help defend western Malta, it faces Valletta and was used as an RAF base during the Second World War. Disappointingly, the fort and a large part of the surroundings are currently closed due to yet more redevelopment. Back across the stone bridge, I race to catch up with Gareth. 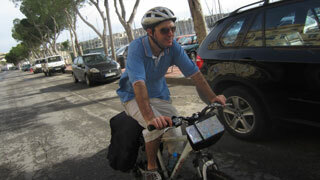 When I reach him in Msida, it's already 13:00 and we must pick up the pace if we are to hand the bikes back on time. After one final bend near the ferry terminal at the southern end of the harbour, we finally divert away from the water front and face our only real challenge of the day, a steep hill up in to the capital along Independence Road and through the imposing Porte des Bombes arches that greet us to the city. 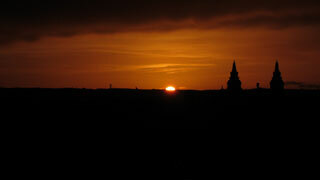 There is a certain north-African vibe to the place, more so than we've noticed elsewhere along our route. A couple of blocks in to town, we spot our bike man, he's waiting for us beside the Triton Fountain, a large roundabout which serves as the rather chaotic main bus station. He checks the bikes over and hands us back our deposits (€25 per bike), leaving us with just our feet to get around the city. Gareth's flight is at 16:50 and we're hoping to fit lunch in before he must head to the airport. 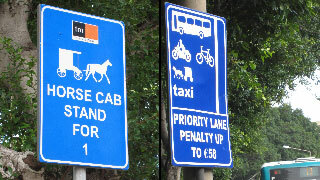 Strangely, the tourist office cannot advise us on journey times or bus routes to the airport, nor on taxi fares (these are not fixed in Malta). So we head over to my hotel, Hotel Castille, where the receptionist is more helpful, although not too reassuring. He calculates Gareth's itinerary and comes to the conclusion that Gareth should have been on his way to the airport about half an hour ago. Lunch is looking less likely. I drop off my bicycle panniers, which are rather awkward to carry, and off we head to the bus station, stopping only to grab takeout from McDonalds. The bus station, which has recently been modernised, is a busy place with 15 platforms. However, the airport service is listed as departing from platform 16. Indeed, at the far end of the terminus beside platform 15, a large sign bears the number 16 and points out to the horizon. None of the local people can help us and, after hiking around in a circle, we finally stumble upon platform 16, beside the place where we handed back our bikes barely an hour ago. While Gareth makes his way to the airport to fly back to London, I contemplate the best way to explore Valletta in the short space of time available. I will use what's left of this afternoon to walk up the eastern side of the peninsula and I'll try to get out early tomorrow to see the western half. 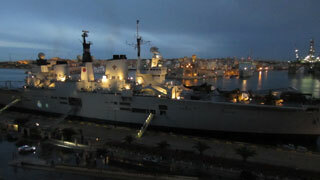 Within minutes, located just around the corner from my hotel, I stumble across HMS Illustrious, which is docked on the eastern side of the city. 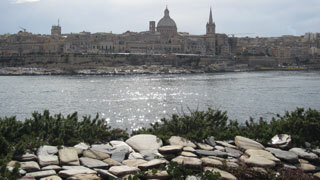 The Grand Harbour provides an impressive backdrop. The sudden arrival of rain forces me back in to the centre of town, where I take refuge for a few minutes in some shops. Then I head up a narrow residential street to the most northerly point of the Sciberras Peninsula, Fort Saint Elmo. From there, as I walk south along the eastern side of the peninsula, the Siege Bell war memorial attracts my attention. It's a gigantic bell that commemorates the victory of the Allied forces during the Second Siege of Malta from 1940 to 1943. The views from here are impressive, but a little bit further along I get an even higher vantage point from the Saluting Battery, perhaps the oldest saluting battery still in operation anywhere in the world. As another downpour passes, I am rewarded with a double rainbow over the fortifications surrounding the Grand Harbour, followed minutes later by a stunning sunset over Valletta. After nightfall, I head in to the centre of town, which is eerily quiet after the shops shut at 19:00, save for a rowdy group of British lads who are breaking crockery on the terrace of a restaurant in the main square. After taking a few night photos, I grab pizza for dinner and head back to my hotel for the night. I'll set my alarm for 7:30 tomorrow. If the weather looks good, I'll explore the rest of the town, if not I'll sleep in.